« Older: The Island Academy Halloween Fun! 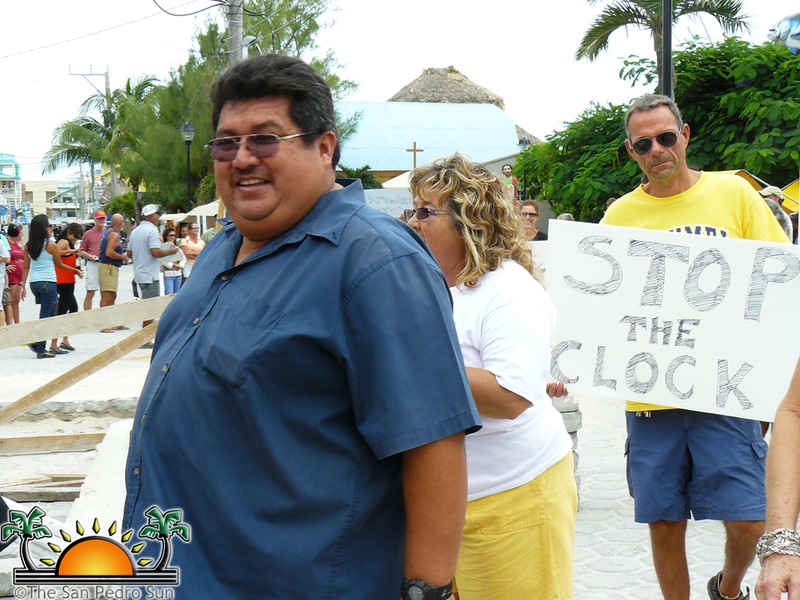 There was a lot of outcry over the decision to place a town clock in the middle of a main street in downtown San Pedro. While many people don't mind having a town clock, issues that arose from our story printed on October 27, 2011 included the location - which to many seemed as obstructive. 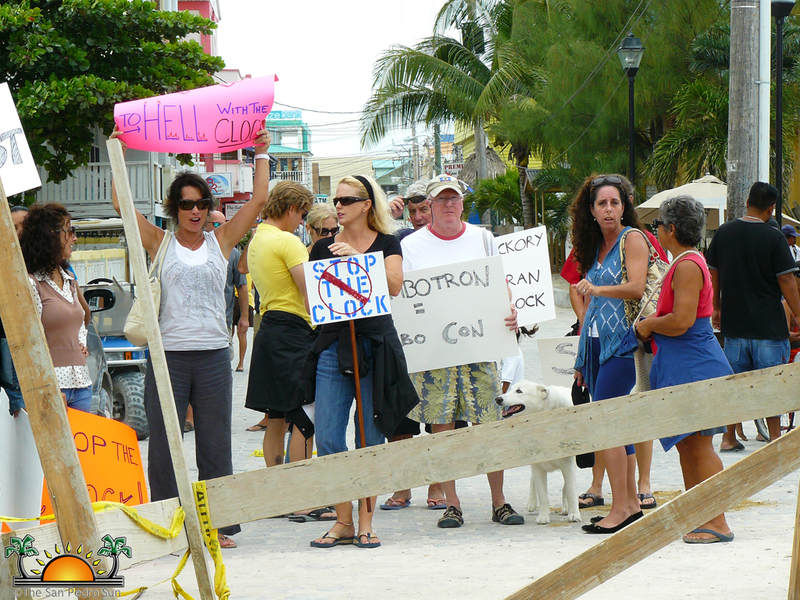 Belize Tourism Industry Association (BTIA), San Pedro, a group of individuals who are stakeholders in the tourism industry wrote a letter to the San Pedro Town Council (SPTC) respectfully requesting that the construction stop so the public opinion could be heard. Below is the correspondence between the BTIA to the SPTC, and a response from the donor, Mr. Richard Headrick of Ramon's Village Resort. 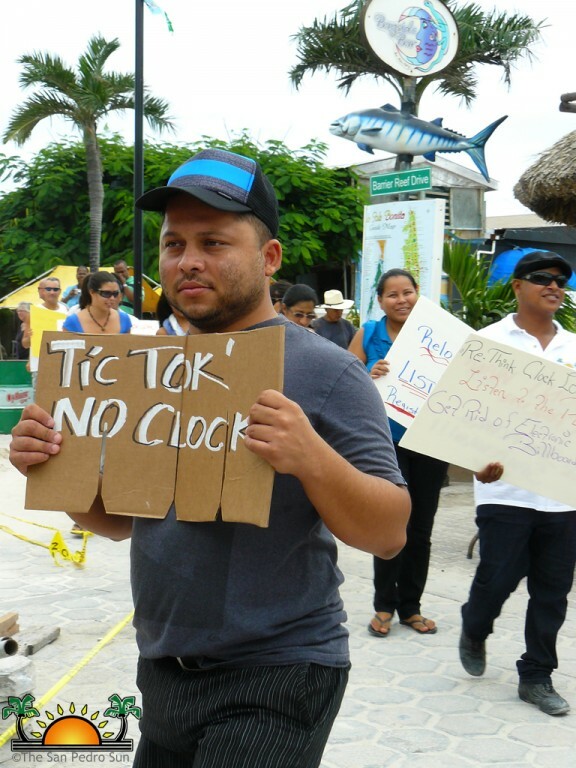 The Board of the San Pedro BTIA is unanimously opposed to the Clock Tower and Ramon’s Billboard currently under construction on Barrier Reef Drive. We respectfully request that you stop work on the project immediately, so that you can take time to listen to the overwhelming opposition to this project amongst businesses and individuals in San Pedro. Had you consulted with the public beforehand, we are confident that you would not have continued with the project as planned. While the reasons are many and varied, the outcry against the Clock Tower and Ramon’s Billboard is understandable and undeniable. We look forward to a favorable reply. I appreciate your concerns, but I had no idea that doing something nice for San Pedro, Ramon's employees, the local merchants and our thousands of visitors to San Pedro each year would cause such turmoil. When we first proposed a community information device for Central Park, I thought it was a good idea and so did everyone we asked; however, the mayor and her council thought our design was a bit simple and, therefore, commissioned a local designer to create a concept that would be both pleasing to the viewer and architecturally conducive to the beauty of San Pedro Town. Our original proposal was for a simple two-sided sign that would be placed in Central Park in place of the thatched palapa previously used by Captain Morgan's to market their property. However, after repeated discussions with Mayor Paz, it was decided that the best place for this landmark tower would be in the center of Barrier Reef Drive. The mayor indicated to us that this clock tower would be the perfect solution for slowing down motorists who continually break the law by exceeding the speed limit. Mayor Paz also thought it may deter big trucks from using Barrier Reef Drive excessively. A full size model of the base for the clock tower was temporarily laid in place several months ago and vehicles of all sorts were driven around it. The results were found that it posed no problem at all for sensibly driven vehicular traffic. We agreed to install the clock/tower where it was thought to best benefit the village, even though cost overruns to us would be $20-25,000 BZ higher than if we had located it in the park just off Barrier Reef Drive. Once the final design and location were approved by the mayor and council, it was decided that the tower needed four clock faces and only two electronic promotional devices. There will be two fixed, non-animated panels on opposite sides of the clock tower which will read "Welcome to San Pedro." P.S. In reference to this being a billboard for Ramon's, the only permanent mention of Ramon's Village on the clock tower is on a brass plaque affixed to the base of the clock tower. The letters reading "Ramon's Village" are a whopping two inches tall. This is an update on the Clock Tower. On Friday, I shared with you a letter from the SP-BTIA Board to the Town Council, respectfully requesting that the Mayor stop work on the clock project in order to hold a public consultation. A copy of that letter was also sent to Ramon's Village. Mr. Richard Hedrick from Ramon's Village Resort kindly took the time to reply to our letter. His letter was read on the morning show today. I have attached it here for your review. 3) The lack of advanced notice or public consultation on the matter. 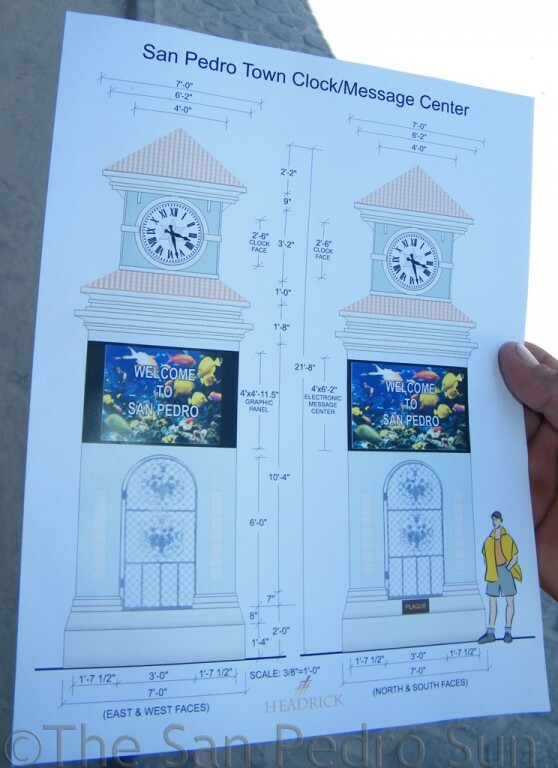 In his letter, Mr. Hedrick explains that the "...emphasis of the electronic portion of the clock tower will be to provide current temperature and public service announcements, special events and festivals that take place in San Pedro. This will not be a device that is for rent." (Emphasis added). The San Pedro Sun organized a peaceful protest against the location, rallying supporters to voice their opinions. At noon on Monday, October 31, 2011, protesters marched at the construction zone, spoke to various media houses and let their voices be heard. 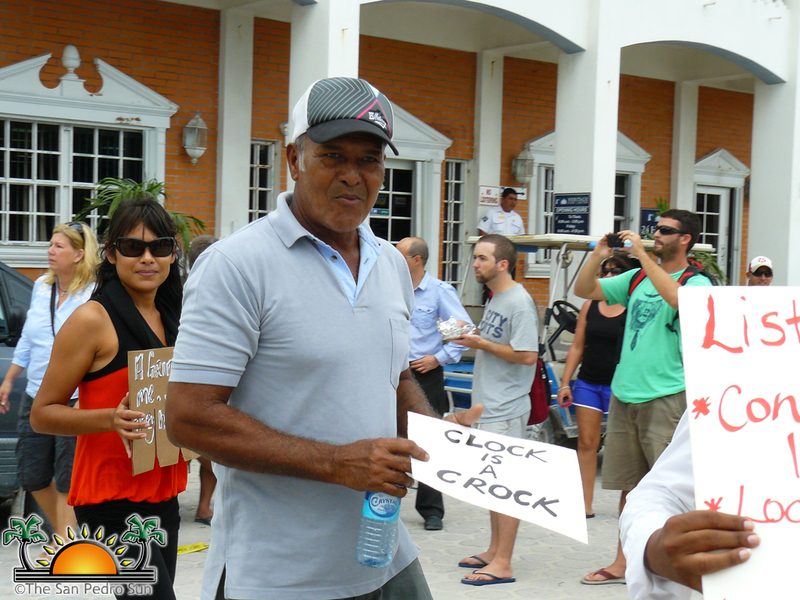 We will be following up on the Town Clock issue, as it is one that affects everyone on the island. Not everyone is against having the town clock, but the location and lack of consultation with the public certainly is an issue. 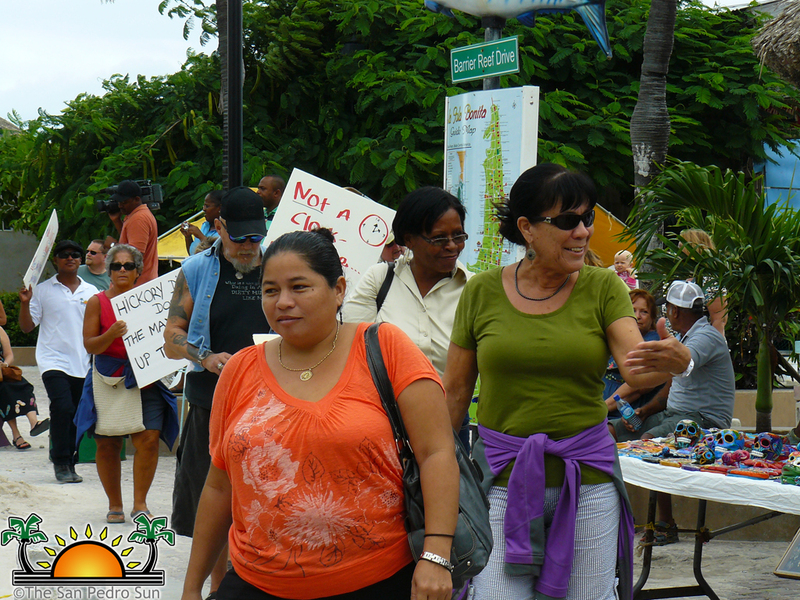 Hopefully Mayor Paz will stop to listen to the suggestions and alternatives from citizens who have the best interest of San Pedro, Ambergris Caye at heart.